We had a great conference! Join us next year at the Hilton Greenville, October 31-November 2, 2018. We are excited to be partnering with SELA for a joint conference next year. At the Marriott in downtown Columbia, SC. Please let us know how we did--the Conference Evaluation is now available. The Conference Program, including schedule and sessions times, is now available! 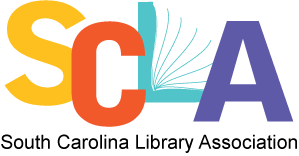 Check out Sched for SCLA 2017, the online and mobile-friendly conference planner where you can see the schedule and create your own! See also the list of poster sessions, Friday Oct. 13, 8:00 a.m. - 10 a.m. The South Carolina Library Association invites all library professionals, paraprofessionals, students, and vendors to our annual conference. Please submit your registration by September 15th to take advantage of the Early Bird rate and save on your costs! More information, prices, agenda, and mail-in registration is available in the conference registration packet. Online conference registration is available for individual registrations only. SCLA is seeking current MLIS students to volunteer for the conference. MLIS student volunteers are needed to help at the registration desk and to help with other tasks during the conference. Volunteers will receive a 3-day conference registration for volunteering 4 hours or more, but this will not include any of the paid events, Zumba, or the luncheons. Dress code is business casual. Please be sure to wear comfortable shoes. Registration ends Saturday, September 30th. We look forward to seeing you there! As a Conference exhibitor and/or sponsor, you will maximize your presence and investments. Thank you for supporting South Carolina libraries! Wednesday, October 11 · 4 - 5:30 p.m.
On Wednesday, October 11th from 4-5:30 p.m., join in a Scholarship for Diversity in Librarianship Mix and Mingle! Hear about the inspiration for the scholarship, its importance to librarianship, the impact it has on the lives of recipients, and how you can support it from a panel of those who have witnessed and experienced it. After the panel discussion, you will get a chance to meet past and current recipients of this life-changing scholarship. There will be door prizes during this event. If you would like to contribute a door prize, contact Cathi Cooper Mack, Chair, Scholarship for Diversity in Librarianship Committee, by e-mail at [email protected]. Thursday, October 12 · 6:15 - 7 a.m.
Wake-up and get your Thursday started right with a ZUMBA workout. Join ZUMBA expert Celeste from 6:15 - 7 a.m. on October 12th to jump-start your day with a fun and powerful work-out session. There is a $10 charge that goes to the scholarship fund for this event. Door prizes will be given during this event. If you would like to contribute a door prize, contact Cathi Cooper Mack, Chair, Scholarship for Diversity in Librarianship Committee, by e-mail at [email protected]. All proceeds benefit the SCLA Scholarship for Diversity in Librarianship, which is conferred annually to a member of an underrepresented population who has shown outstanding academic aptitude for librarianship. Once again, the Scholarship for Diversity in Librarianship Committee will hold its popular SILENT AUCTION fundraiser! Every year there are themed gift baskets, beautiful artwork, food, memorabilia, and much more to win. All proceeds benefit the SCLA Scholarship for Diversity in Librarianship, which is conferred annually to a member of an underrepresented population who has shown outstanding academic aptitude for librarianship. If you would like to donate an item for the Silent Auction, contact Cathi Cooper Mack, Scholarship for Diversity in Librarianship Committee Chair, by e-mail ([email protected]) or complete the Silent Auction Google Form (https://goo.gl/forms/CiRpscxsewsR8rOu1) with a title, brief description, starting bid, and your name and contact information as contributor for each item you donate.